We’d love your help. Let us know what’s wrong with this preview of The Wishing Hill by Holly Robinson. When her brother asks her to come home to wintery New England and care for th What if everything you knew about your life was wrong? To ask other readers questions about The Wishing Hill, please sign up. Wow!! I truly loved THE WISHING HILL from the very first page. Holly pulls you right in and never lets you go! I was totally caught up in all the characters lives and found myself cheering for Juliet along the way! She learns some deep secrets about herself and her family. Everything she thought was her life was a total lie. From her idiot, soon to be ex husband to her own mother. She has been dealt a pretty harsh hand and now must find a way to deal with it and learn to move on. What will she choose? Who will she be with? You are going to have to read THE WISHING HILL to find out! I was flipping the pages like crazy, I couldn't stop! I had to see how the story was going to end. Many times I wanted to take Desiree and shake her to death! How can anyone be so mean spirited? I was yelling at Juliet to just run away from her! Goodreads Description- What if everything you knew about your life was wrong? When her brother asks her to come home to wintery New England and care for their ailing mother, a flamboyant actress with a storied past, Juliet goes reluctantly. She and her self-a Goodreads Description- What if everything you knew about your life was wrong? No one is perfect. It is our flaws that make us human. Holly Robinson creates some very human characters in The Wishing Hill: A Novel. Narrated by two women, Juliet and Claire, this book drew me in within the first few pages. An artist in Puerto Vallarta, Mexico we first meet Juliet 5 months after her husband left her. She is 40 and pregnant by someone not her husband. She is vividly drawn and an intersting woman. Her brother Will calls her to return home to help him take care of thier mother who No one is perfect. It is our flaws that make us human. Holly Robinson creates some very human characters in The Wishing Hill: A Novel. Narrated by two women, Juliet and Claire, this book drew me in within the first few pages. An artist in Puerto Vallarta, Mexico we first meet Juliet 5 months after her husband left her. She is 40 and pregnant by someone not her husband. She is vividly drawn and an intersting woman. Her brother Will calls her to return home to help him take care of thier mother who recently fell and broke her hip and now is in rehab. Juliet and her mother Desiree, have a strained relationship and Juliet does not want to enter the fray, especially now that she is pregnant. Hoping to get there, help out and return to Mexico before anyone can tell she is pregnant, she agrees to go. Claire is Desiree's neighbor in Byfield, Massachuettes. She is retired from her own insurance business and an avid bird watcher. She lives only with her dog tadpole. Strained neighbors, we quickly learn they are more to each other. And so begins the complicated story of these women's lives told from alternating viewpoints. The strength of his book lies in its female charaters. All of them have their strengths but none of them are perfect. It allows the reader to watch as characters try to come to terms with the decisions they have made in their lifetimes. If I had one wish for this book it is that the male characters were as complex. With the exception of Juliet's ex-husband, they are all too good to be true. Still this book was a pleasurable read. There are no real surprises in this book for this reviewer. The pleasure comes from the characters and their relationships with each other. Ian, one of the chacaters sums up the beauty of this book. "Maybe you don't have to think any one thing about her [Desiree]," ..."Maybe this is just your life, and there are many people in it who care about you in their own imperfect way. You should embrace it all." Bathed in the lush, golden hues of Puerto Vallarta, Juliet Clark spends each sitting on the beaches of Mexico's Pacific Coast, painting landscapes and vaguely feigning a Mexican heritage to the tourists who come to buy her work as the waves lap at the shoreline. When faced with unexpected desertion of her husband, Juliet Clark is at a loss; her tranquil bliss comes to an abrupt halt. Like the native Huichol Indians performing breathtaking ritual, the dance of the flyer, her life has taken on the feel of a free fall ballet. Furthering her sense of loss of gravity, a phone call, explaining that under no uncertain terms, she must leave her idyllic life and return home to care for her aging mother, a woman who, during Juliet's childhood, was constantly preoccupied with creating a grandiose public facade, while covering her personal inadequacies in a garnered sense of entitlement and self importance, drawn from the admiration of others. Her preoccupation with success in her career as an actress overshadowed the authenticity of her relationship with her childen, who were often neglected while Desiree, her mother, pursued her own interests and romantic relationships that would both serve as fuel for her narcissistic need to be constantly adored and who would supplement her personal income. In the The Wishing Hill: A Novel, author Holly Robinson takes us to a place of hidden intimacy between mothers and daughters, exposing the pain of their choices and the fears that lay behind them. Written with tender honesty, she holds out her hand, offering her characters with a vulnerability that is, at times, unsettling. The fragile nature of generations of women is beautified in their heartbreaks and their uncertainties, even as they are made strong through the power of their convictions. I had high hopes for this book due to the many positive reviews, however, I thought the book was just ok. I really couldn't identify with any of the characters. In fact, the character Claire, I found to be just down right annoying. She is an extremely negative individual who judges those around her with every conversation and meeting. The book was written well enough in its prose, but I felt that it dragged along and the storylines weren't very interesting. I would not recommend this book to anyo I had high hopes for this book due to the many positive reviews, however, I thought the book was just ok. I really couldn't identify with any of the characters. In fact, the character Claire, I found to be just down right annoying. She is an extremely negative individual who judges those around her with every conversation and meeting. Loved the charaters in this book. This book is well written but the plot was predictable and the characters more like caricatures. What I liked: It's a story about generations. There are a couple of geriatric protagonists and a few other geriatric characters each of which the author blesses with a unique personality and role to play. Some of the settings, hospitals, nursing homes, elderly traveling among the young are presented in a thoughtful way that attempts to explore the world from a geriatric point of view and create sympathy in a younger reader. I am not sure how these scenes read for older readers? Do they feel shal What I liked: It's a story about generations. There are a couple of geriatric protagonists and a few other geriatric characters each of which the author blesses with a unique personality and role to play. Some of the settings, hospitals, nursing homes, elderly traveling among the young are presented in a thoughtful way that attempts to explore the world from a geriatric point of view and create sympathy in a younger reader. I am not sure how these scenes read for older readers? Do they feel shallow? Does the depiction of aging here feel true? I liked that the author attempted to realize old age and allow aged characters central roles in the story. But, overall, this story felt too contrived to satisfy me. The characters sometimes seemed like cardboard cut-outs. Rather than fully realized characters the protagonists were often more like vehicles for dialog and narrative voice. They were sketches of roles rather than fully-cast acted parts in a play. This story didn't do it for me. It was OK - but didn't feel like the author's best effort. I felt a bit cheated of my time in the end. Your mileage may vary though, because Robinson is a talented writer. Don't hesitate to try this one yourself because of my experience, or give The Gerbil Farmer's Daughter: A Memoir or Beach Plum Island a try. I think both of those outstretch this . Juliet Clark is an artist, living in Mexico where she sells her paintings to tourists in Puerto Vallarta. She has recently separated from her husband and finds out she is pregnant but her ex husband is not the father. Juliet's brother Will convinces her to come home to Massachusetts to help care for their aging mother who recently fell and broke her hip. She agrees even though she has a strained relationship with her mother, Desiree. She plans to help her mother get back on her feet and then ret Juliet Clark is an artist, living in Mexico where she sells her paintings to tourists in Puerto Vallarta. She has recently separated from her husband and finds out she is pregnant but her ex husband is not the father. Juliet's brother Will convinces her to come home to Massachusetts to help care for their aging mother who recently fell and broke her hip. She agrees even though she has a strained relationship with her mother, Desiree. She plans to help her mother get back on her feet and then return to Mexico before anyone discovers she's pregnant. But while she's there she uncovers some shocking secrets that make her question everything she thought she knew about her life. This book is about Juliet, a painter who comes back to Boston to care for her mother who fell and broke her hip. In the nursing home she develops an infection and that puts her back in the hospital. Juliet's brother comes from CT to help out. Desiree, their mother was an actress and is now in her 70's. CLaire the next door neighbor remembers Juliet and saves her from going through the icy pond. The story tells of her life and marriage. Love what the title means and remember my daughter speaking of this same thing that happened around their house near Seattle. My grandson calls them fuzzballs. Love the link in this story about them. Love the detailed descriptions of the different places and Juliet's paintings.. Especially liked hearing of the knitting for the charity-didn't see this coming! Love the path her career takes her to, so she can freely express herself. I received this book from Edelweiss by Penguin Group (USA) Inc.in exchange for my honest review. I liked this book but didn’t love it. I thought the story was basically good but parts of it really dragged for me. I really like the author’s writing style but I was never really invested in the story. I didn’t feel as though I couldn’t wait to pick it up again when I had to put it down. The ending is what really disappointed me. There was a lot that was left completely unresolved for me and this caused my opinion of the book as a whole to slip drastically. The characters in the book are very we I liked this book but didn’t love it. I thought the story was basically good but parts of it really dragged for me. I really like the author’s writing style but I was never really invested in the story. I didn’t feel as though I couldn’t wait to pick it up again when I had to put it down. The ending is what really disappointed me. There was a lot that was left completely unresolved for me and this caused my opinion of the book as a whole to slip drastically. I won a copyof this book through a Goodreads First Reads giveaway. I'd give it 2.5 stars. I love that Puerto Vallarta was one of the locations that this story took place. It actually added some color to a gray book (both through location & plot). I had a hard time liking any of the main female characters but still admired their survival despite their complicated histories. Ian & Giles were great though I felt like their characters existed only to provide some romance to a bland story. Not I won a copyof this book through a Goodreads First Reads giveaway. Better than I expected. As Shari said...a good summer read. Easygoing. Loved, loved this book. Holly Robinson does a terrific job in creating memorable characters that you fall in love with. Highly readable, but ultimately slight. A good beach read. Good book but a little too much introspection for me. uliet has been dumped by her husband, is pregnant, and now has to return to her home in New England to care for her mother whom she ran away from years ago. What Juliet doesn't realize is that going home will reveal secrets that will forever change how she views her family and her future. The setting begins with Juliet, a successful artist living in Mexico. Her husband, Michael, has left her and she has recently found out she was pregnant. As she struggles with how to handle the chaos in her life uliet has been dumped by her husband, is pregnant, and now has to return to her home in New England to care for her mother whom she ran away from years ago. What Juliet doesn't realize is that going home will reveal secrets that will forever change how she views her family and her future. The setting begins with Juliet, a successful artist living in Mexico. Her husband, Michael, has left her and she has recently found out she was pregnant. As she struggles with how to handle the chaos in her life, her brother, a successful and busy lawyer, asks her to return to the states to care for their mother after a fall breaks her hip. Not surprisingly, Juliet agrees to care for her mother and this is where the story gets interesting. Juliet's mother, Desiree is an actress and is completely selfish and truly someone you will love to hate while reading the book. She is negative, self-absorbed, and pouts if her daughter and friends don't cater to her. Desiree is definitely a drama queen in more ways than one. She makes everyone around her feel inadequate. You really feel quite sad for Juliet for having to deal with her mother. While Juliet is home, we are also introduced to Claire, Desiree's neighbor. Desiree and Claire do not get along and Juliet can't understand why since Claire has been nothing but kind to her. As you can imagine, this is where the secrets come in. Juliet is also quite smitten with the handyman she hired to remodel her mother's home to make it more accessible once she returns. Once Ian finds out she is pregnant, Juliet is afraid he won't give her a second look. Ian's character though is quite surprising and I felt like he was a stable outsider for Juliet in giving her the advice and support she needed at just the right times. This story had several twists and turns and seemed to take its time in getting to the resolution of Juliet's problems. Even though each step of the way was fairly predictable , I still cared enough about the characters to keep reading. As the author described Juliet's paintings, you could envision the vibrant colors and scenes she was creating and wished you could hang them in your own home. Thankfully, Juliet's art allowed her a diversion and brought a sense of peace in her life. You may not be completely satisfied once you finish the novel as the author doesn't tie up all the loose ends. You are left to wonder about the relationships and decisions made and imagining how you hope they will turn out. Recommends it for: contemporary family drama. Contemporary Fiction is such a broad category that to label the book as such is really not telling the reader anything. On the other hand, I am always a bit leery of labeling a book as Chick-Lit because I think that many readers make assumptions about the book based solely on that. In fact, I used to think that I was not a big fan of "chick-lit" but as I have read more and more books in this genre I realized that I do like chick-lit, but that I am just picky about the books I read. I find that i Contemporary Fiction is such a broad category that to label the book as such is really not telling the reader anything. On the other hand, I am always a bit leery of labeling a book as Chick-Lit because I think that many readers make assumptions about the book based solely on that. In fact, I used to think that I was not a big fan of "chick-lit" but as I have read more and more books in this genre I realized that I do like chick-lit, but that I am just picky about the books I read. I find that if the characters have something other than the run of the mill personality or back story. I am more likely to enjoy the book. Likewise, if the plot is varied and the issues presented unique in some way, I am more likely to enjoy the book. The Wishing Hill by Holly Robinson fits both of these criteria for me. The main characters in The Wishing Hill are three women whose lives are linked together in an unbreakable way, although we may not understand what that is at the beginning of the book. Juliet is a women coming up on middle age who finds herself suddenly on her own. Her husband has left her and the bohemian lifestyle they were living, leaving her surprised and wondering where her life is leading now. On top of it all, she finds herself unexpectedly pregnant after years of thinking that she is infertile. Desiree is Juliet's mother, an aging actress who is used to being the center of attention and afraid that life is passing her by. Claire, Desiree's neighbor, is a single woman in her 60s who has never married, but still is in love with the married man who she had an affair with in her early twenties. All of them are strong women in their own way. Even the male characters in this book were unique. In fact, I would love to read a book where any one of the male characters were the main focus, that is how interesting they seemed to be. From Will, Juliet's staid, middle class brother, all the way to the divorced contractor working on Juliet and Desiree's house. The storyline of The Wishing Hill did not disappoint, either. It is more than just the a story of three women with intertwining lives. Although the main focus of the book is on how the three women's lives intersect, we are also treated to their separate stories, which I found very interesting. As with the male characters, I think that any one of these stories could have sustained a book all on their own. You might think that having all of the stories in one novel would be confusing, but Holly Robinson uses different points of view and travel between locations to weave them together until they make one seamless story. Holly Robinson's insights and superb writing talent made this book a joy to read and one that I would easily recommend to my friends, or even buy for someone. As for me, I am looking forward to other novels by Holly and hope to read much more by her. I began The Wishing Hill late one afternoon and finished it the next morning. What a compelling read, what complex and fascinating female characters! Both plot and character motivation hinge on the keeping and unraveling of family secrets, and this reader was on edge until the very last chapter wondering if the exposure of lies and coverups would be this family's undoing...or its salvation. Forty-year-old artist Juliet must return to Massachusetts from Mexico to help take care of her aging mother I began The Wishing Hill late one afternoon and finished it the next morning. What a compelling read, what complex and fascinating female characters! Both plot and character motivation hinge on the keeping and unraveling of family secrets, and this reader was on edge until the very last chapter wondering if the exposure of lies and coverups would be this family's undoing...or its salvation. Forty-year-old artist Juliet must return to Massachusetts from Mexico to help take care of her aging mother who is recovering slowly from a fall. Her return is complicated by a recent split from her husband, a surprise pregnancy from a casual rebound relationship, and the fact of a fractious relationship with her mother, Desiree. Juliet intends to do her duty by Desiree and then return to her adopted homeland and her painting, but her diva mother isn't throwing herself into rehab as purposefully as she should and Juliet's brother is unable to devote as much time to the rehab as he would like. Juliet seems stuck, perhaps for a reason, she realizes, as the appearance of an otherwise reclusive neighbor, Claire, begins to reveal family mysteries that have been to date well-hidden. The Wishing Hill is about three strong and complicated women – Juliet, Claire, and Desiree – whose lives were shaped by a family secret. Throughout of her life Juliet felt her flamboyant mother was absent. Desiree put her theatrical career and the men she loved first in her life, and Juliet and her brother Will were often left to fend for themselves. Claire was the mysterious neighbor who never interacted with Juliet until Desiree was hospitalized. What was their secret? Juliet had a successful c The Wishing Hill is about three strong and complicated women – Juliet, Claire, and Desiree – whose lives were shaped by a family secret. Throughout of her life Juliet felt her flamboyant mother was absent. Desiree put her theatrical career and the men she loved first in her life, and Juliet and her brother Will were often left to fend for themselves. Claire was the mysterious neighbor who never interacted with Juliet until Desiree was hospitalized. What was their secret? Juliet had a successful career painting watercolors and selling them to tourists in Puerto Vallarta. When Will called and told her he needed her to come home to care for their mother when she was released from the hospital. Juliet balked at first. She and her mother had a difficult relationship. Plus Juliet had secrets of her own, and she wasn't willing to share them just yet. Robinson paints a story that is credible with well-developed characters that are flawed and multifaceted. This is clearly an author I will follow. 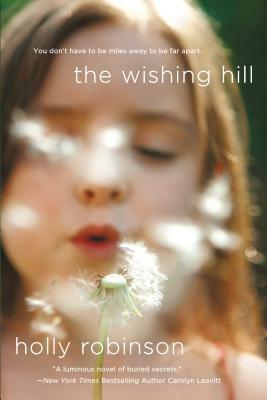 THE WISHING HILL was entertaining from beginning to end and filled with compassion, warmth, humor, and a bit of romance. Family relationships are never easy, but Holly Robinson and addressed the pitfalls of secrets kept. I give Holly Robinson’s THE WISHING HILL five stars. To find out more about this author and her books visit Holly Robinson’s website at http://authorhollyrobinson.com/my-books/, on Facebook at https://www.facebook.com/holly.robins..., and on Twitter at https://twitter.com/hollyrob1. Memories can be a strong influence on how you feel and think. What you think you know and remember from an old memory may in fact not be accurate at all? The older we get, the more our memories can, in fact, fool us. The author has created a story that takes a seemingly typical family, and exposes the secrets of who they really are. A mother that is flighty and flamboyant; a brother that is close yet so far away, and a strange, yet kind, neighbor that Mother has had a long standing feud with that Memories can be a strong influence on how you feel and think. What you think you know and remember from an old memory may in fact not be accurate at all? The older we get, the more our memories can, in fact, fool us. The author has created a story that takes a seemingly typical family, and exposes the secrets of who they really are. A mother that is flighty and flamboyant; a brother that is close yet so far away, and a strange, yet kind, neighbor that Mother has had a long standing feud with that no one understands. Throw in Mom’s crazy behavior and her dearest friend and you have a story full of secrets, fading memories and strange behavior. The Wishing Hill is a wonderfully written novel that will keep you turning the pages as fast as you can. The story line twists and turns and keeps you thinking about what is the truth and what is not. What the main character Julie thinks she knows as the truth about her family will soon be something completely different. First, disclaimers: I know Holly and live in the area she used for her setting. This only added to the pleasure of the book's experience. This book greeted me each morning like an old friend. The characters are expertly crafted and the story unfolds beautifully in an unhurried and confident way. The characters breathed for me and I loved them for their faults as well as their strengths. Holly has a gift in telling a story about a small slice of life in a way that champions all of us. As readers, First, disclaimers: I know Holly and live in the area she used for her setting. This only added to the pleasure of the book's experience. Holly has a gift in telling a story about a small slice of life in a way that champions all of us. As readers, we are brought into the story like a best friend being told a confidence. We understand the choices made and support them, as a friend would, even if we do not agree with them. The book is filled with descriptions of gorgeous colors and landscapes and did what the best of books do - to suspend me in its world. Holly Robinson is the author of The Gerbil Farmer's Daughter: a Memoir as well as several novels, including Sleeping Tigers, The Wishing Hill, Beach Plum Island, and Haven Lake. Her essays, articles and columns have appeared in a variety of national publications. She also works as a ghost writer and book doctor on celebrity memoirs and other nonfiction books. Holly holds a B.A. in biology from Cla Holly Robinson is the author of The Gerbil Farmer's Daughter: a Memoir as well as several novels, including Sleeping Tigers, The Wishing Hill, Beach Plum Island, and Haven Lake. Holly holds a B.A. in biology from Clark University and is a graduate of the MFA program in Creative Writing at the University of Massachusetts, Amherst.